The term most used to describe tenkara is "simple." Fellow tenkara angler Morgan Lyle has gone one better and has written a book on simple flies. 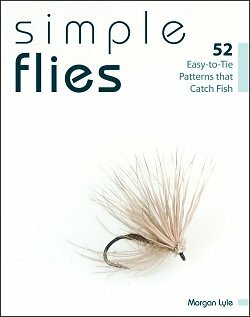 There are some tenkara flies in the book, the iconic Ishigaki and the Takayama Sakasa Kebari, and some, like the CDC & Elk on the cover and the Stewart Black Spider (the first of the 52 patterns) that are not Japanese tenkara flies, but are certainly simple flies that work very well with tenkara rods. And of course, my favorite, the Killer Bug, is in there as well. Truth be told, I don't think you need 52 flies. I do think, however, that you will find flies in this book that you will want to tie, and if you tie them you will catch fish with them. You could easily pick a couple wets, a couple nymphs and a couple dries and have a six pack of flies that will catch fish for you just about anywhere (and give you enough variation that you don't get bored with just one fly). One of the things I really like about the book is that Morgan "gets it" with respect to yarn bodied flies. He has several in the book, including one that I'd never seen or heard of before. They're dead simple to tie and they WORK! I did have to rib Morgan at least a little bit, though. He wrote that I was a graduate of Colorado State when actually it was the University of Colorado. Worse, even though I was indeed a stock trader, I did not trade "at the New York Stock Exchange," which would have required so much money I could have just retired and gone fishing every day instead. Still, it is very flattering to have been included in his book. Buy the book. You'll like it - and you'll learn from it - and you'll catch fish, which after all, is what it's all about.